A new law has come into force which is intended to make it easier to prosecute companies accused of causing death because of negligence. Under the new offence of corporate manslaughter, employers may face large fines if it is proved they failed to take proper safety precautions. The old law was criticised for making it too hard to bring prosecutions. Proof is no longer needed that a single senior official was to blame, only that senior management played a role. Under the new UK-wide legislation companies may face higher fines of up to 10% of turnover, or more in the most serious cases. And for the first time the Corporate Manslaughter and Corporate Homicide Act will make government bodies liable for prosecution by lifting their Crown immunity. Justice minister Maria Eagle said: "From Sunday the law ensures improved justice for victims of corporate failures. "We are sending out a very powerful deterrent message to those organisations which do not take their health and safety responsibilities seriously." Critics of the new law, which comes into force more than 10 years after Labour promised the legislation, say it does not go far enough. Tony Woodley, joint general secretary of trade union Unite, said: "Individual directors or senior managers will still not be held responsible for health and safety failures that result in the death of either their employees or members of the public." Construction industry union Ucatt was even more damning, describing the law as "the dampest of damp squibs". Ucatt general secretary Alan Ritchie said: "Only by creating the possibility that directors will go to jail will there be a change of culture in the construction industry. "The new Act will not save the life of a single construction worker," he said, adding that in 2007, 77 construction workers were killed at work. 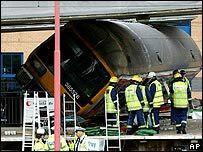 Similar measures to those in the new legislation were first proposed in 1997 by then Home Secretary Jack Straw in the wake of the Southall rail crash which killed seven people. But there has been public outrage at the repeated collapse of prosecutions over disasters such as the Southall crash. Legal experts warn the implementation of the new law will not be straightforward. Julian Acratopulo of law firm Clifford Chance said employers would face uncertainty when the law was first put into practice. He said: "The growing pains of this new piece of legislation will be particularly acute, given that a conviction could occur in circumstances most of us would regard as a terrible but unfortunate accident." One area that still needs clarification is how to proportion responsibility between middle and senior management. The Sentencing Advisory Panel has also suggested that major national companies who are found guilty should be forced to publicly name and shame themselves in media adverts.